The warm gold and relaxing pink shades in Longevity provide a beautiful, calm centre piece for your room. Mix it up with more decadent golds and classic, deep ebony whilst providing interest on the walls with story telling pattern or exude the simplicity and beauty of neutrals with a tranquil backdrop. A Mid century, traditional and modern vibe works so well with this design. 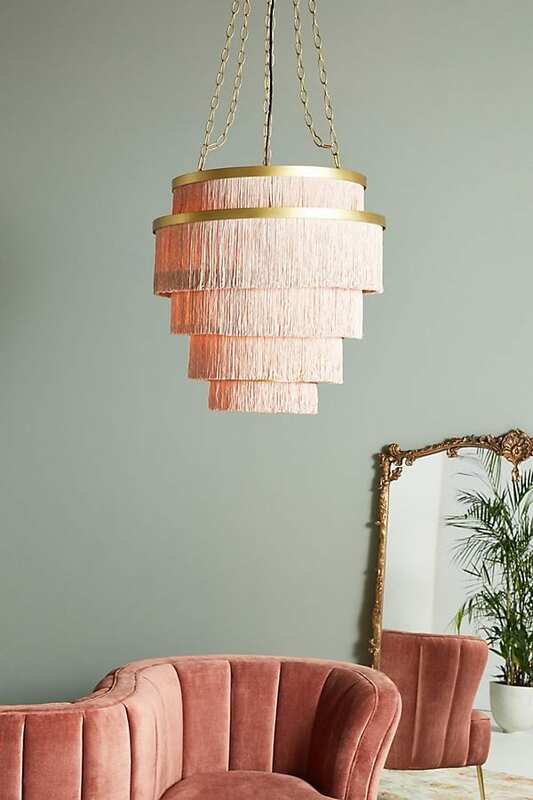 Pink, being first used in the 17th Century is associated with charm, sensitivity and romance whilst the addition of black lends a seductive air and shimmering gold accents add that touch of luxury. 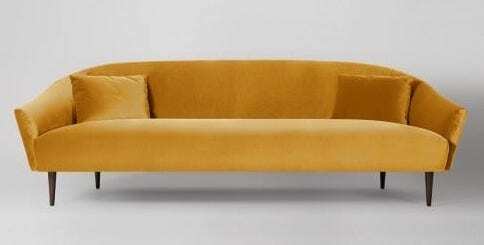 Firstly, how about the elegant golden sofa in sumptuous velvet from Swoon Editions? It compliments the golden hues throughout Longevity and creates a beautiful contrast to the black mountains. It also provides elegant yet comfortable seating and would look great placed either side of the rug or place a sofa on one side and two occasional chairs on the other to provide lots of visual interest. The tactile honey coloured velvet offers soft, contemporary seating whilst the block colour flatters the rug pattern and enables your eye to rest. The rolling curve of the sofa gently emulates the curves of blossom on Longevity too. 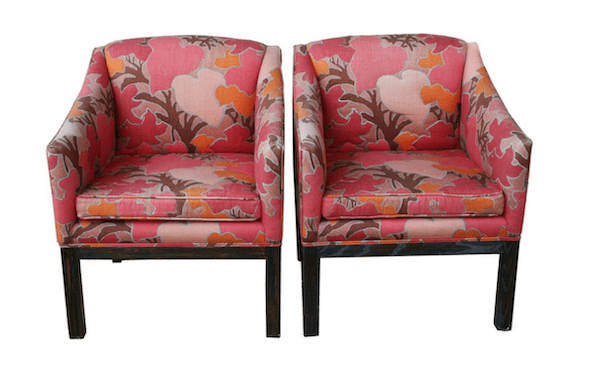 When I spotted these stunning tub chairs on 1st dibs I knew intuitively they would work. 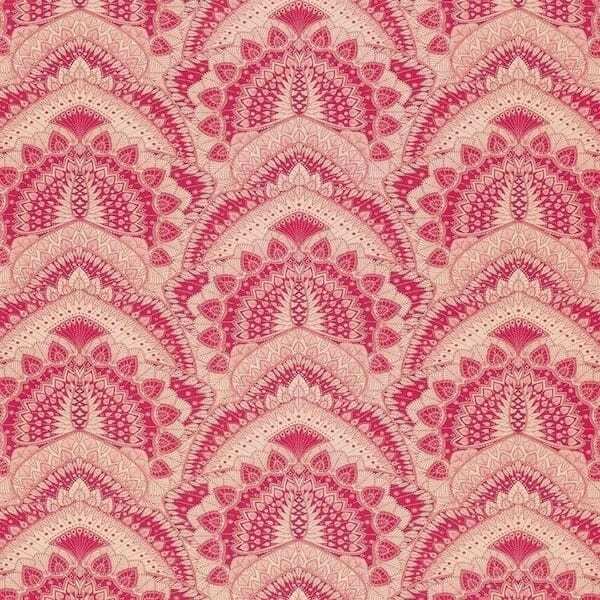 The richly coloured blend of pinks and curving pattern on the fabric echoes the tree motif. The shot of vibrancy demonstrates that a stronger tone works well with the soft pink and adds weight to the scheme. These are beautiful antique chairs but the shape is a classic design that is found widespread nowadays. The advantage of choosing your own fabric and having chairs upholstered enables you to have something you truly love and compliments your scheme. Any of the fabrics featured on the board would work in tandem and heighten the visual intrigue. Alongside the classic tub chairs this delightfully decorative chair is full of charm! It’s a classic Ming style and adds another wow to your room. This example is handmade and handpainted. The form enhances the elegance of the rug and synchronizes with the black mountain landscape. It provides an oriental aesthetic that adds another dimension of sophistication. 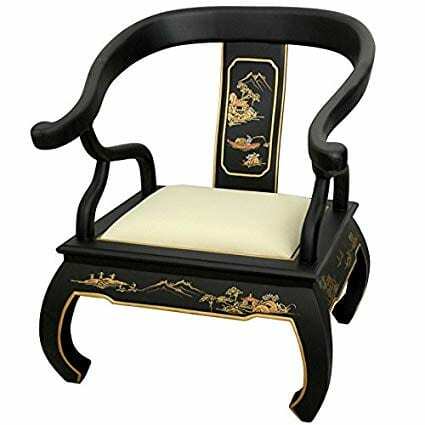 Although this one was found on www.orientalfurniture.com there are other magnificent options on www.shimu.co.uk. 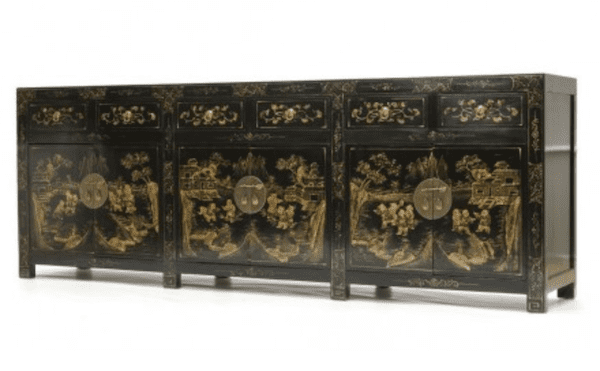 Keeping with the oriental flavour I couldn’t help but fall in love with this captivating cabinet. Sitting along a wall in your sitting or dining room it adds so much handsome appeal as well as great storage. 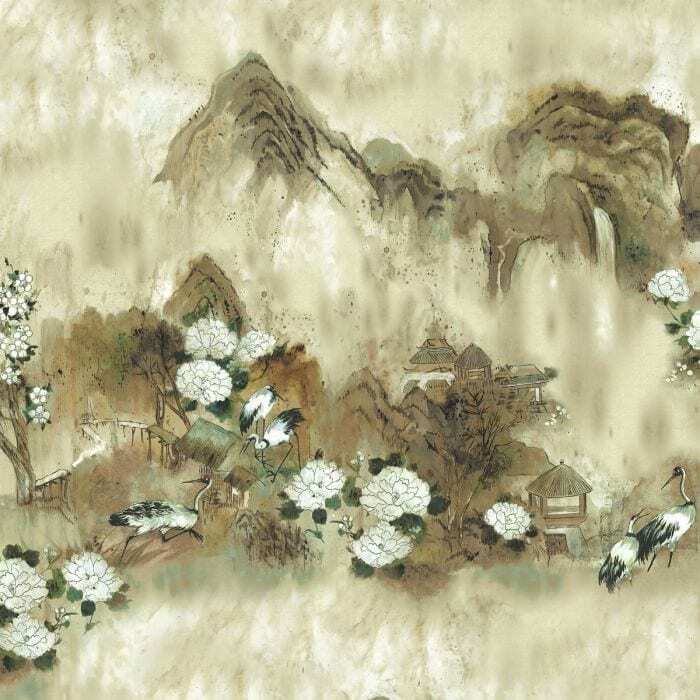 I found this piece on orchid furniture and the elaborately decorated, golden hand-painted scenes of lively rural life augment the setting for Longevity in story like perfection. Of course you could place a more contemporary cabinet or sideboard with this scheme to create a more pared back look. 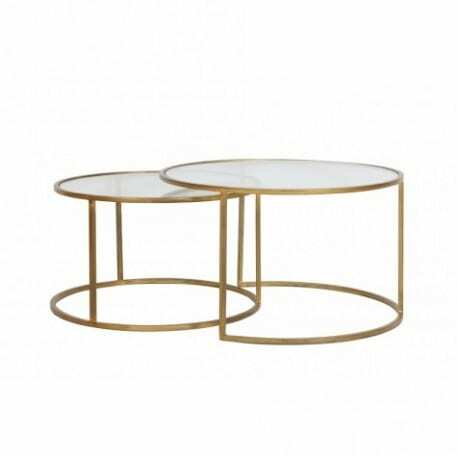 Whilst searching for furniture I also found on the same site these beautifully organic circular glass coffee tables, which let the full scene of the rug radiate from beneath but also provide a space for drinks, flowers, candles and/or the most splendid green vase by Georg Jenson. 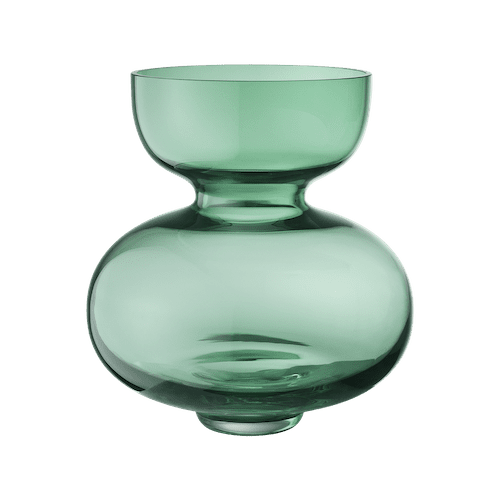 The green accent of the vase enhances the round clear glass table but also demonstrates a thoughtful, creative design, reflecting nature through the use of green glass and the organic, tactile shape which evokes a sense of calm and beauty and balances the use of pink, gold and black throughout the room. Another very useful piece of furniture is the occasional table. I found this beauty on www.audenza.com. 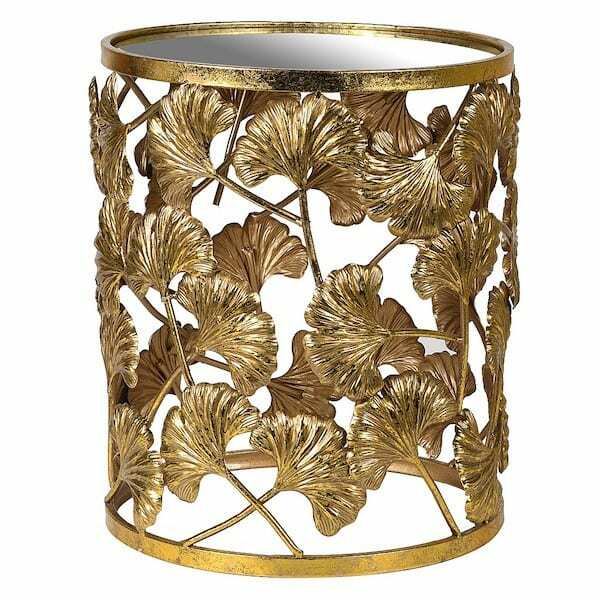 The ginkgo leaf is just the ticket for keeping an Asian aesthetic and exudes a further appeal of nature. It’s such a versatile piece as you can move it around to that perfect spot where it adds form and function. I was spoilt for choice whilst searching for a beautiful backdrop for Longevity but a wall treatment I was instantly drawn too is the magical Kashgar mural. 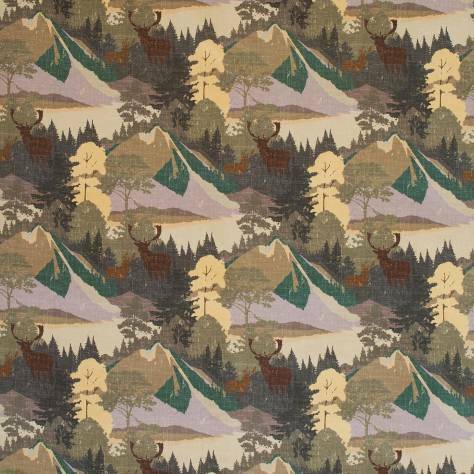 This exquisite paper with its topical mountain theme drew my breath away. The painterly scene and sense of depth elevates the scheme creating an air of mystery and intrigue. Its neutral colourway strengthens the glamour of the pink blossom in the rug and the landscape prompts a sense of wonder that I love! The green leaves tie in with the green vase and keep everything mellow. 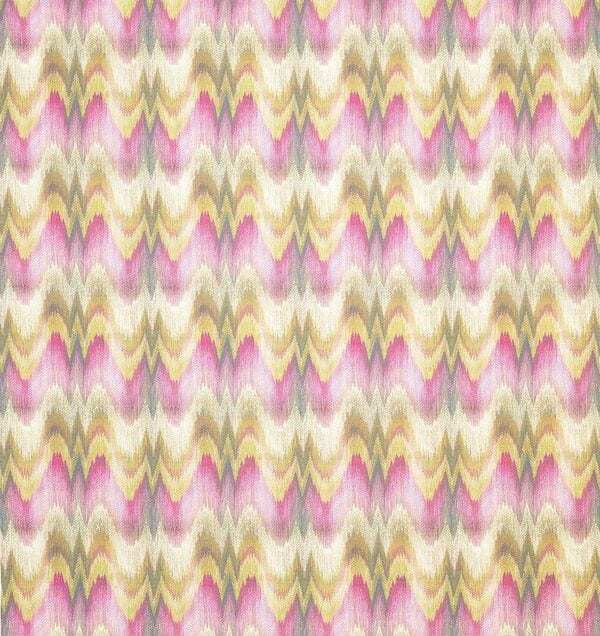 Another wall choice however, is this striking herringbone fabric. It would make a beautiful backdrop placing a large framed piece on the wall or lining one complete wall. Alternatively, it would be make stunning curtains or a blind where its full pattern is evident. 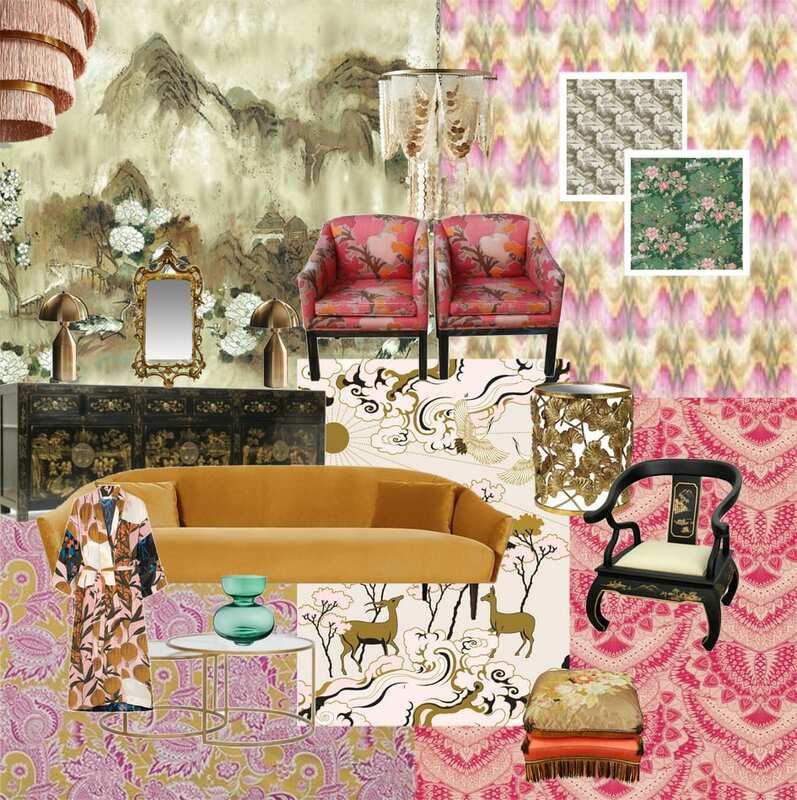 Osborne and Little also stock the gorgeous Durbar collection by Matthew Williamson. The stylized Azari linen union fabric highlights the rich pink of the tub chairs and enriches Longevity with its portrayal of peacock feathers in a monochrome line drawing. 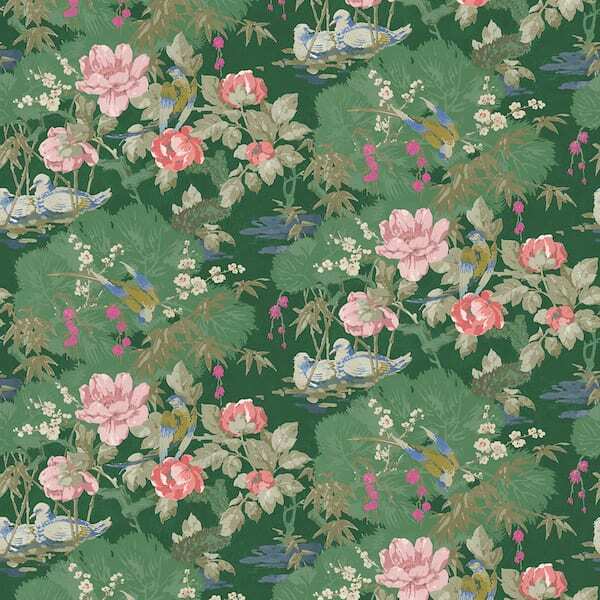 I think it would make fabulous curtains or cushions providing an exotic hint alongside Longevity. Moving onto lighting, once again I discovered there is so much perfect choice. Often my one stop shop is www.anthropolgie.com and it certainly didn’t disappoint this time! I discovered an enchanting chandelier that integrates with the scheme both in colour and style. Namely, the decadent Aloha fringe chandelier with five tiers of fabulous texture and movement. 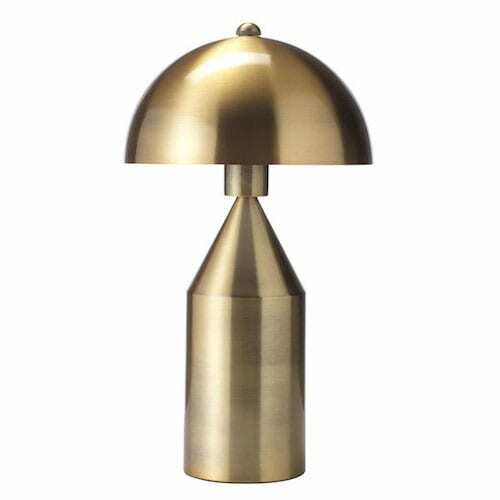 The contemporary Albany table lamps featured on the sideboard are from www.trouva.com. They keep everything restful and organic and the simple shape is in stark contrast to the intricate design detail on the cabinet adding to the playfulness of the interior. Onto accessories for the final flourish ! I came across both the wonderfully complimentary neutral choice of the Nova Scotia adding a sense of spirit and adventure with its mountains and lakes, www.linwoodfabric.com as well as Linwoods’ ‘On the River’ Emerald fabric both of which would make striking cushions on the golden sofa. This sample board is an indication of what you can realise in your room scheme with Longevity. I hope it fires your imagination and/or works with your current treasures to further your love of the rug ! Never miss a thing. Sign up to our newsletter.